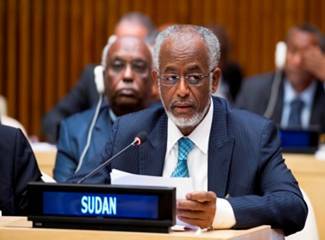 May 9, 2014 (KHARTOUM) � Sudanese foreign minister Ali Karti has criticised Cairo�s approach to dealing with the issue of Ethiopia�s Grand Renaissance Dam (EGRD), calling on the Egyptian media and other circles to stop what he described as �clowning�. In statements to pro-government Ashorooq TV, Karti said that Sudan would have suffered the most if constructing the dam was done without environmental studies to prove its safety or economic feasibility to the three main Nile Basin countries . Karti stressed that when his government felt that there was a slackening in examining these issues, it formed a national committee to study all aspects of the dam with the right to cooperate with any of the national committees in Ethiopia or Egypt. He described Egyptian-Sudanese relations as good, emphasising that Sudan has refused to intervene in the ongoing political crisis in Egypt as it is an internal affair in which it respected the will of the Egyptian people and their choice towards change. Meanwhile, Sudanese presidential assistant Ibrahim Ghandour lashed out at some sections of the Egyptian media, saying some journalists have been playing an increasingly negative role in the relationship between the two countries. Ghandour said that the Sudanese people will never forget the abuses of some of those affiliated with the Egyptian media and their attempts to incite Cairo against Khartoum, as well as some of the statements peddled by some Egyptian politicians against Sudan. He underscored that Sudanese people are intelligent and tolerant but never forget contempt. Sudan has approved of Ethiopia�s bid to build the dam thus angering their Egyptian neighbour. Egypt fears that the $4.6 billion hydropower plant will diminish its share of the river�s water flows, arguing its historic water rights must be maintained. Ethiopia is the source of about 85% of the Nile�s water, mainly through rainfall in its highlands, with over 90% of Egyptians relying on water from the Nile�s flows. In June, a panel of international experts tasked with studying the impacts of the Ethiopian dam on lower riparian countries, including Sudan and Egypt, found that the dam project will not cause significant harm to either country. Cairo remains unconvinced and has sought further studies and consultation with Khartoum and Addis Ababa.